When you go out driving with your fancy Dan sat nav it is easy to forget how lucky we are these days. I came across some details of the first ever in-car map reading system the other day. 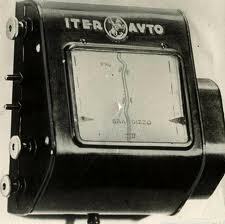 It was called the Iter Avto and was created in the 1930s. Basically a map was connected to a reader on the dashboard and scrolled back and forward, linked to the speed of the vehicle. It is a pretty clever system although I wouldn’t imagine that it was foolproof. Had it been a great success then it stands to reason that we would have seen a lot more of them over the years. I lived abroad for a year or so and when I got back to the UK in 2004 I came across websites with step by step driving directions for the first time, so I am guessing that they just got popular round about then. They seemed like a great advance at the time but looking back now they were extremely cumbersome. The first time I used one of these sites I had to drive from my new home in London up to see my family in the West of Scotland. I checked the site, printed the sheets and made the journey with about 3 sheets of A4 paper balanced on the passenger seat. Every time I stopped at traffic lights I would sneak a look at the instructions to see where on earth I had to go next. I well remember going round in circles around about Derbyshire and desperately looking for somewhere to pull in, switch on the light and read the blooming bits of paper. Now we have sat navs that talk to us and make sure that we get where we are going without any hassle at all. The Iter Avto has a wonderfully enticing, old world feel to it. However, the world moves on and we need to consign it to the history books along with winkle pickers, opal fruits and that strange roller machine my Mum used to wring clothes dry. Can You Imagine an Oz Road Trip? This entry was posted in News and Views and tagged car, Iter Avto, London, LS, Scotland, seat, speed, traffic lights, UK by Robert Bell. Bookmark the permalink.